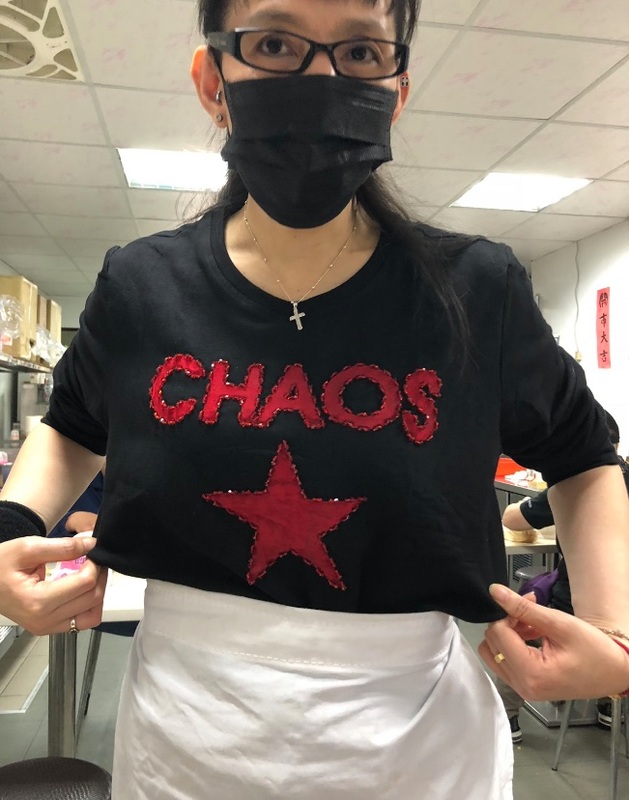 I wonder what the woman wearing this T-shirt thinks the word "chaos" on it means. And why did the designers of the T-shirt choose that particular word? What was in their mind when they put it on their product next to that large, single star, which reminds me of the flag of Vietnam? 1. A condition or place of great disorder or confusion. 2. A disorderly mass; a jumble: The desk was a chaos of papers and unopened letters. 3. often Chaos The disordered state of unformed matter and infinite space supposed in some cosmogonic views to have existed before the ordered universe. 5. Mathematics A dynamical system that has a sensitive dependence on its initial conditions. 6. Obsolete An abyss; a chasm. Those are listed pretty much at random, except for the first one which popped into my consciousness right off the bat as the primal cosmological concept with which I often deal in studying and teaching about Chinese civilization. But that's just one of the many meanings of "chaos" in English. We also have to take into consideration its use in political, social, physical, mathematical, and other contexts. Figuring out how best to render "chaos" into Chinese in each of those senses is no small task. Each of the Chinese terms has a primary signification, but also carries with it different connotations depending upon the particular circumstances in which it is being used. Hence we are faced with the highly polysemous English term "chaos" and numerous possible translations in Chinese, each conveying a variety of nuances. I dare say that translating "chaos" into any number of other languages would also prove to be challenging. However, since the problem of how to interpret "chaos" in another language first came to me with regard to Chinese, let us look a little more closely at how to match up the various Chinese possibilities in different fields. Here follows a little lesson in the language of political upheaval and social chaos, with relevant vocabulary for domestic, medical, and other applications. For the political or social sense, hǔnluàn 混乱 might work, so we could say zhèngzhì hǔnluàn 政治混乱 ("political chaos"). In fact, this is probably the most common way to refer to chaos in the sociopolitical sense, but it is rather general and doesn't necessarily indicate a pronounced degree of turmoil in society. Sāoluàn 骚乱 and dòngluàn 动乱 (the latter probably stronger and indicating that things are getting more out of control than the former, which is used for reports about the Yellow Vest Movement in Paris) are also frequently used in the sociopolitical sense, though they are perhaps closer to riot, turmoil, or turbulence than to chaos. Here are some other possibilities that may be coupled (following zhèngzhì 政治 ["political"]): sāodòng 骚动, dòngdàng 动荡, and biàngù 变故. They all indicate various types and degrees of sociopolitical disruptions, disturbances, and dislocations. Luàn xiàng 乱象 is also available, but has broader applications ("chaotic appearance; mass confusion"). Another formulation would be to say zhèngzhì wěnluàn 政治紊亂 or shèhuì wěnluàn 社會紊亂, which I would prefer to render as "political disorder" and "social disorder". This same wěnluàn 紊亂 could be used for systemic dysfunction, e.g., dàixiè wěnluàn 代谢紊乱 ("metabolic disorder"). In most of these collocations, zhèngjú 政局 ("political situation") may be substituted for zhèngzhì 政治 ("political"). Língluàn 凌乱 is more often used to describe messy households. Yītuánzāo 一团糟 is used when things have been bungled or are in shambles. One of the first foreigners to ever write about China and chaos theory—perhaps the first—was Reverend Smith, who cautioned in 1912 that change was coming to China and that "it will be well if it come not too rapidly to permit of the gradual preparation of the individual and the family to receive it. Otherwise, social and ethical chaos may be the result." Finally, for those of you who have been dying to know how to say "chaos theory" in Chinese, it is hùndùn lǐlùn 混沌理论, where the "chaos" is that primordial, cosmological concept we began with. Hùndùn "primordial chaos" is cognate with Huntun (húntun, 餛飩, 馄饨) "wonton; dumpling soup" written with the "eat radical" 食. Note that the English loanword wonton is borrowed from the Cantonese pronunciation wan4tan1. Mair suggests a fundamental connection between hundun and wonton: "The undifferentiated soup of primordial chaos. As it begins to differentiate, dumpling-blobs of matter coalesce. … With the evolution of human consciousness and reflectiveness, the soup was adopted as a suitable metaphor for chaos." For the quotation in the last sentence, see Victor H. Mair, Wandering on the way: Early Taoist Tales and Parables of Chuang Tzu (New York: Bantam Books, 1994), p. 386. A word on a T-shirt often leads to days of reflections and research. What is the message? What is she trying to tell us? Does she even know herself? I notice that 混乱, which you give as hǔnluàn, can be pronounced either hǔnluàn or hùnluàn. What is the status of these pronunciations? Are they in free variation or is there some kind of 'standardisation' in China or Taiwan? 乱 can mean various things maybe. Seems like it can mean political disintegration or simple disorderliness. A bar where people have been known to take off their shirts (this was in Chengdu) was described to me as 乱. Since then, I attached it to places where people are generally disobedient. Beijing says it fears chaos, which ultimately means…loss of their control? An alternative parsing of CHAOS is of course as the plural (in English) of Chao, meaning, in English, a person surnamed 趙. One might, for example, refer to the present U.S. Secretary of Transportation together with her close blood relatives as "the Chaos." In a PRC context, refusal to use the approved alternative romanization ZHAOS might suggest the sort of non-compliant attitude that the PRC authorities might think could lead to 混乱. There's also 一塌糊涂, which to my ear expresses the same thought as the words above but is a little softer. I strongly suspect it's an attempt to 'copy' T-shirts with the Nietzsche quote 'You must have chaos within you to give birth to a dancing star' vel sim., as here. The original is 'man muß noch Chaos in sich haben, um einen tanzenden Stern gebären zu können', from Also sprach Zarathustra, which if I were forced to translate I'd be tempted to go for something like 'Ye must still have chaos within you to be able to bear a dancing star', going for a cod-Biblical tone. IIRC, there are "Sacred Chaos" (plural, rhyming with "cows") in the Illuminatus trilogy. Thanks very much for the last three comments, loonquawl, TheLong1930s, and Adam F.
On the pronunciation of 混乱, my old Gwoyeu tsyrdean gives hoenluann (i.e., hǔnluàn). That's how I learned it, and that's how it sticks in my mind. The mainland sources I've checked give hùnluàn. Another meaning for Chaos is the genus of amoebae. The old Linnaean binomial designation of the giant amoeba, Chaos chaos is, sadly, considered obsolete (see ). My link to the Wikipedia article on 'Chaos (genus)' didn't work. loonquawl's suggestion that the shirt denotes (in part) some kind of Elric fandom is amusing but hardly seems likely. Then again, what do I know? Is Moorcock's fantasy popular in the Sinosphere? A red five-pointed star on a black field is the flag of the EZLN (Zapatista Army of National Liberation), which is an anarcho-socialist group of primarily indigenous Maya farmers in the South of Mexico. They have strong anti-capitalist and anti-colonialist stances in addition to their anarchist/anti-authoritarian stance, hence the star and red-and-black color scheme associated with anarcho-socialism and anarcho-communism. I'd be willing to bet that the "CHAOS" text is primarily because it pops up in English thesauruses as a synonym for "anarchy", which is in turn at least morphologically related to "anarchism". I'd also guess that the prevalence of the word "chaos" in political punditry regarding China (along with its complex semantic weight in English) is a factor in why it was chosen over a more straightforward word like "anarchy". It's very obviously related to anarchy. Red and black are the colors of anarcho-communism (among other things), and the red star has a long history as a symbol of socialist movements. Probably "chaos" is just a poor translation, or poor understanding, of "anarchy." Adding to J.W. Brewer's comment, we note that of course, Yuen Ren Chao titled his family autobiography "Life with Chaos". "Rhyming with cows" is close to how "chaos" is pronounced in other languages, including the original Greek. Reading about “Chaos” on this Language Log reminded me of an incident from the early 1970’s when I was a grad student at UC-Berkeley. One day while in downtown Berkeley I saw Y.R. Chao and his wife in their car. Catching my attention was their car’s license plate; it was a vanity plate on which was written “CHAOS”, a droll pun Y. R. Chao who was well known for his sense of humor must have felt was irresistible. In my mind, 混沌 hùndùn "primordial chaos" is an interesting case of convergent evolution. I know the word only through the Pan Gu myth, in which it refers to the stuff in the universe before the world was created. This is an excellent match to the early Greek sense of "chaos", the primordial stuff of the universe. But the myth elaborates a bit on just what 混沌 is: in the beginning, everything in the world was all jumbled together in a big egg-shaped object, and the 混沌 was that object. So we see a kind of match to the modern english sense of "chaos".